Navigating your environment in the fastest most efficient way possible. Parkour is the art of using the human body as a moving object to transport oneself from A-B. 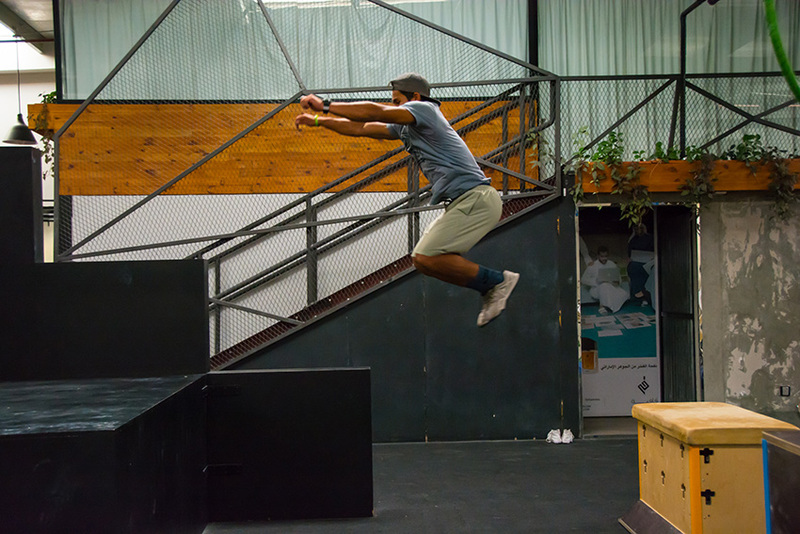 The schedule offers five forms of Parkour classes at our facility; Parkour Level 1, Parkour Level 2, Kids Parkour Level 1, Kids Parkour Level 2 & Parkour Conditioning. Parkour: For the adults, a whole lot of obstacle running and jump formations. This class teaches the members the theories of Parkour and different methods of using the discipline in their environment, all while getting a workout in. Kids Parkour: The beginning stages of utilising their energy to increase balance, agility and form; this class teaches our young members how to use their natural ability of movement to navigate and get across spaces efficiently. Parkour Conditioning: To make the Parkour journey as quicker learning curve, this class provides the members with circuit-like training that works on movements used in the Parkour class. This will allow the muscles that are used most to become stronger. Dubai's first movement academy specialising in calisthenics and parkour as well as tumbling, aerial acrobatics, inversions, climbing and more. Copyright © 2019 Gravity Calisthenics Gym. All rights reserved.